Miniature versions of green cabbage, Brussels sprouts (Brassica oleracea) are tiny green leafy vegetables dating back to ancient times. Brussels sprouts are said to owe their name to the Belgian city of Brussels, where they first gained popularity. Nowadays, this bud-vegetable has become quite popular, with numerous studies asserting its beneficial effects on human health and tracing these benefits back to its good nutritional profile and naturally occurring sulfur compounds with anticancer potential. Brussels sprouts are an incredible source of vitamins C and K, two nutrients with outstanding antimicrobial, anti-inflammatory as well as antioxidant properties. The two vitamins are particularly healthy for the cardiovascular, circulatory and immune system. Brussels sprouts are also a good source of vitamin A and folic acid and thus great for preventing eye-related health problems and spine and brain defects in newborns. Lastly, iron and phosphorus help prevent anemia and low energy levels and support bone health. As stated above, Brussels sprouts belong to the cabbage family (Brassica oleracea) and, as such, are related to white, green and red cabbage, cauliflower, broccoli and kale, some of the most nutritious greens you can put on your plate. What do Brussels sprouts look like? Most people know that Brussels sprouts are like miniature round green cabages. But here is where things get interesting: Brussels sprouts actually grow attached to a thick, deep green stem growing upwards, with a sort of loosely-wraped green cabbage on top, very similar to a vegetable-flower. From a distance, the plant resembles a sort of unripe palm tree. What do Brussels sprouts taste like? Brussels sprouts taste good, just not like sweet like carrots or potatoes, but rather like bitter leafy greens. Despite their bad reputation, they are quite similar to cabagge or other Brassica oleracea members, just slightly bitter. Because taste perception may differ greatly between different individuals, some may find them more bitther than others, but still palatable (in their own bitter way). 1) Low in fat and calories and a good source of fiber. 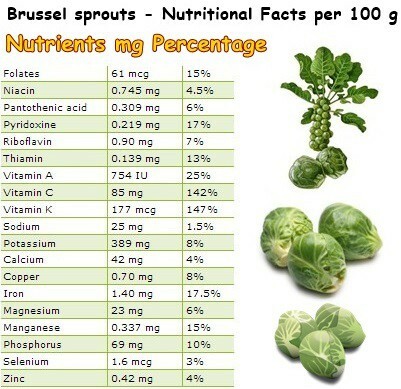 100 g of raw Brussels sprouts contains 0.3% fat, only 43 kcal (kilocalories) and 3.8 g of dietary fiber. This makes them ideal if you are trying to either lose weight or keep a steady weight, provided you substitute, let’s say, one serving of something creamy or fried with a generous portion of Brussels sprouts. Because just adding more calories, even in the form of veggies, isn’t productive. The good fiber content not only aids digestion, but also helps relieve constipation by adding bulk to stools which, stimulating intestinal transit and encouraging more frequent and regular bowel movements. 2) Good for cardiovascular health. The fiber in Brussels sprouts prevents the intestines from absorbing all the fat from the foods you eat and thus indirectly contributes to lowering blood cholesterol levels. Moreover, having such a high content of vitamin C, Brussels sprouts have a protective antioxidant effect on the arteries, further contributing to cardiovascular health by preventing fat oxidation (known as lipid peroxidation). 3) Rich in vitamins C and K. Vitamin C acts as a powerful antimicrobial with great stimulative effects on the immune system. Having enough vitamin C in your diet helps prevent scurvy, bad teeth, gum disease, skin problems (wrinkles) and recurrent ear and respiratory tract infections. Vitamin K supports blood coagulation processes (it prevents bleeding following surgery, birth, etc. ), prevents arterial calcification (when calcium deposits on artery walls, heart valves causing atherosclerosis and stroke), helps maintain bone health and limits nerve cell damage in Alzheimer’s patients. However, if you have been prescribed anticoagulants, it might be best to ask your doctor how much leafy greens rich in vitamin K you can eat (because vitamin K encourage blood to clot). Both vitamin C and vitamin K are known natural antioxidants and anti-inflammatory agents, reducing inflammation markers associated with chronic disease (cancer, diabetes, hear disease). 4) Good source of vitamin A. Brussels sprouts are a good source of vitamin A, as well as antioxidants with provitamin A activity, notably beta-carotene, lutein and zeaxanthin. This makes them excellent promoters of good vision. Lutein and zeaxanthin are physical constituents of our retina so having them in our diet is imperative if we want to prevent loss of central vision (or macular degeneration) as a result of growing older. 5) Good source of B vitamins and minerals. Brussels sprouts contain good amounts of B vitamins, notably B1, B6 and B9, known for supporting healthy vision, carbohydrate synthesis, improving brain function and digestion and ensuring the proper development of unborn babies. Iron stimulates red blood cell production, prevents anemia and improves energy levels. Manganese exhibits a powerful antioxidant activity while phosphorus maintains hormonal balance and supports bone formation. See more information on the benefits and side effects of vitamins and minerals. 6) Anticancer activity. Research on the anticancer properties of Brussels sprouts has revealed the fact that these tiny cabbage look-a-likes are rich in phytochemicals such as thiocyanate, isothiocyanates, sinigrin, indole and sulforaphane which are said to offer considerable protection against colon and prostate cancer by inhibiting carcinogens. Conclusion. Overall, Brussels sprouts boast a good nutritional profile, being especially rich in vitamins C and K, two powerful anti-inflammatory and antioxidant agents. Ongoing research greatly encourages regular consumption, labelling the vegetable as a must-eat. So what do you say: are Brussels sprouts benefits worth the taste? If so, what is your secret to making them taste better?